Hi ladies and gents, good morning, last week was a wet week as there were nasty monsoons hovering east coast and northern region of the country. As a result, flood was reported along that straits. I hope this rainy weather will end soon. Ok, lets see whats on today news. -U.S. stocks fell for a third straight day on Friday as investors took weaker-than-expected results from computer maker Dell and homebuilder D.R. 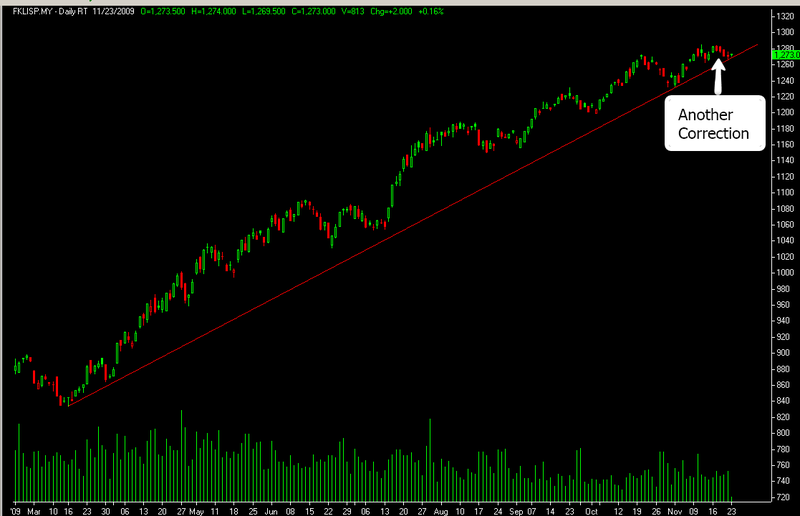 Horton (DHI.N) as a further sign that the recovery would be anemic. The Dow Jones industrial average .DJI fell 14.28 points, or 0.14 percent, to 10,318.16. The Standard & Poor's 500 Index .SPX dropped 3.52 points, or 0.32 percent, to 1,091.38. The Nasdaq Composite Index .IXIC slipped 10.78 points, or 0.50 percent, to 2,146.04. -The north-east monsoon which lashed most parts of the country was the principal catalyst behind this market’s well over RM250 leap in price over the past fortnight. For sure the floods not only have hampered the harvesting of palm oil fruits, they also must have disrupted the logistics of transporting the fresh fruit bunches to the refineries and palm olein to the ports for export. –Dow Jones news wire. -Crude oil rose from a one-week low on speculation demand will increase as the global economy recovers from its worst recession since World War II. Crude oil for January delivery rose as much as 58 cents, or 0.9%, to $77.47 a barrel in after-hours electronic trading on NYMEX. -Soybeans rose to a three-month high on signs that demand is increasing in China, the world’s biggest importer. Soybean futures for January delivery rose 7 cents, or 0.7%, to $10.46 a bushel on the Chicago Board of Trade. *Japan market will be closed for today in accordance with their Thanksgiving Day. Well, short day are over guys, uptrend still intact as this bearish momentum is just another corrections. 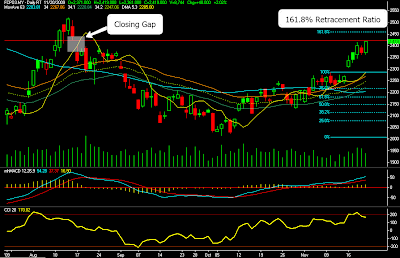 I am expecting palm oil price to close that gap, if it does it will be another indication of strong uptrend. Or it may close the gap and retrace about 2%. Time will tell whether price will find resistance at 161.8% retracement ratio. Its an art, so this ratios is just a reference. Either way, always trail your stops / profits.